The Winter / Summer Solstice, depending on which hemisphere you’re in. As the consciousness of the world shifts into a higher state, you may find yourselves feeling deep love, but also despair in these changing times. You are not alone! We are all interconnected in a web of loving kindness and peace. There are so many beings awakening here on earth. By maintaining the frequency of love, light and joy within each one of us, we are assisting in this shift. and visualising us all in resonance with each other. Lighting up and strengthening each other through the grandmother web of Light & Love is truly blissful. Meditation on the Heart Chakra symbol by Kat Day coming soon. Thank you for the reblog 🙂 Loving Kindness is so worth sharing! Like. This is coolio Pleiadian Buddhism juice :). Mucho gratitudo Cosmico Loti! Thanks Jinx 🙂 I do like the message of love that our starseed community is spreading. I hope it continues to grow. Crapola, the meditation’s gone, it really was muy bien ta tien; you could really get a feeling for all those souls linked in love. I can’t find it on YT anywhere, does it still exist? Bummer. Must’ve snuck off while I was away. Thanks for letting me know. It’s cool, Solara’s on the case! See above. 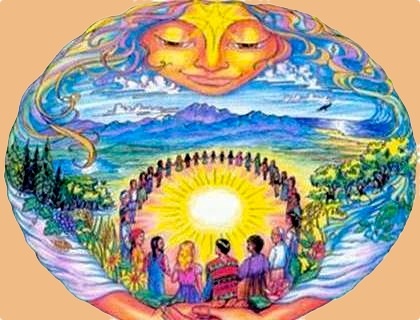 Could you please tell me who did the beautiful solstice artwork of the woman cradling the sun and the people around the world? It is a lovely image, but I’m afraid I don’t know who to credit it to.